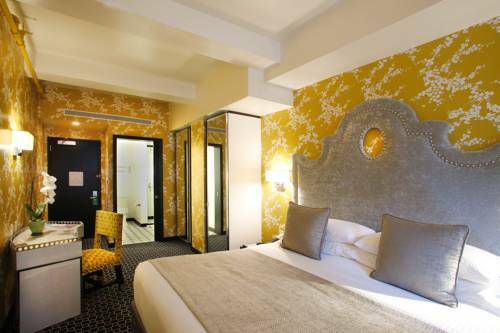 New hotel in the heart of Times Square, Room Mate Grace is an elegant, cutting edge designed hotel with a focus on comfort and service. Located near Broadway shows, Bryant Park, Rockefeller Center, 6th Ave. Business Centers, 5th Ave. shopping, attractions, museums, restaurants, and all that NYC is famous for. Room Mate Grace is the stylish solution for the savvy traveler who wishes to experience the sophistication and fun New York has to offer. All 139 rooms are well equipped with the latest in technology and provide a quiet room to sleep or work in. Highlights include pillow-top mattresses on platform beds with storage underneath Egyptian cotton bedding, laptop size safe, 32 inch flat-screen TV's, iHomes, iron/ironing board, mini fridge, coffee/tea maker. Spacious new bathrooms feature rain fall showers and ample counter space. All guests enjoy free Wi-Fi throughout the entire hotel, Wimate (free wifi in the city) and free local calls. Use of fitness center with cardio machines, indoor pool/sauna. Room Mate Grace features a unique lobby and event space complete with an indoor pool sauna and Aqua Bar. Stadium stairs lead to the mezzanine level a haven for VIP's in the evening and early risers heading off to work who enjoy continental breakfast in style and comfort. The mezzanine doubles as meeting space for those looking to work creatively. A new Hotel in the heart of Times Square Room Mate Grace is an elegant cutting edge design Hotel focused on comfort and service. Steps to: Rockefeller Center, Bryant Park, Broadway Shows, Radio City Music Hall, 5th Ave. shops, Museum of Modern Art and St. Patrick s Cathedral. Nearby transportation includes Grand Central Terminal and Port Authority Bus Terminal. Subway, Metro stations: #1, D,B,N,Q,R Nearby airports include John F. Kennedy International Airport,Newark International Airport and La Guardia Airport. Largest Modern Art Museum in NYC. 10 Building complex home to NBC, Top the Rock Observation Deck, Home offices of Large Corporations, shops, restaurants and Rockefeller Ice Skating in the winter months.